Schematic representation of a permanent magnet shaker emphasizing the magnetic circuit and armature suspension. Radial polarized rare-earth magnets form a ring between two soft iron pole pieces, providing a radial flux through the armature’s wound coil. Two sets of axially separated flexures center the armature in the gap while allowing axial stroke against a soft spring-rate. This configuration stiffly resists cross-axis translation and all rotations. Left - Magnetic circuit elements and flexures. Right - Armature showing suspension flexure spacing and voice coil. Two typical permanent magnet shakers, an MS Series on the left and a VT Series on the right. Whether you are shopping for your first shaker system, or just experiencing your first visit to the Sentek Dynamics Website, you may feel a little overwhelmed. We build a lot of different shaker systems! So let’s spend a few minutes together to gain an overview and understanding of what is offered and why. Firstly, all of our shakers are electrodynamic shakers. They rely on the same physical relationships that make a loudspeaker work. Basically, when a current passes through a wire that is in a magnetic field, a force perpendicular to the wire and to the magnetic flux is induced in the wire. The amount of force is proportional to the current, to the magnetic flux and to the length of wire in the magnetic field. We wind the wire around a cylindrical coil form that is part of the shaker armature and elastically suspend it in a radial magnetic field. This results in an axial force acting on the armature in proportion to the applied current. The suspension holds the coil concentric within the magnetic field. It allows the armature to move a limited distance axially relative to the shaker body. This limited distance is termed the shaker’s displacement stroke. Our smallest shakers use permanent magnets to provide the magnetic field. They employ simple elastic flexures as the spring-like suspension. These simple machines have a structure similar to a loudspeaker, but are far more robustly built. Typically, these shakers are used to provide an oscillating force to a structure that is supported by its own foundation. That is, they do not normally bear the weight of the item being tested. The force is frequently conveyed to the test object by a thin rod termed a drive quill or stinger, and the force is often measured by a force sensor mounted between the stinger and the device under test (DUT). If the DUT is light enough, it may simply be secured directly to the shaker armature for a whole-body shake. In this case, available shaker vibration stroke (a.k.a. peak-to-peak displacement) is surrendered to the static deflection of the shaker’s suspension under the weight of the DUT. Two series of permanent magnet shakers are offered. The Sentek Dynamics’ MS Series shakers are optimized for stinger attachment and are particularly recommended for modal analysis. The MS Series can tolerate a sustained DC bias current, and may be provided with an optional automatic armature centering (AAC) option allowing a DC bias to hold the stinger in tension. The VT Series allows stinger use, but also provides a small circular load table surface to support a small DUT; they are recommended for academic and general laboratory use. Smaller VT Series shakers feature slightly higher maximum operating frequency than their MS counterpart. Sentek Dynamics’ permanent magnet shakers provide a maximum peak sine force of 20 N (4.5 lb) to 1000 N (224.4 lb) with strokes ranging from ±4 mm (±0.16 in) to ±12.5 mm (±0.5 in). They weigh between 2 kg (4.4 lb) and 62 kg (136.4 lb). All MS and VT Series shakers come trunnion-mounted. The trunnion is a simple support-base structure that allows the shaker to be oriented horizontally or vertically (or at an angle in between). If desired, the shaker can be separated from the trunnion when a lower height vertical unit is needed or when you want to suspend an MS Series shaker using a bungee or other support. Various options are offered for these shakers including a cooling blower recommended for continuous operation at high power levels. VT and MS Series shakers are fundamental tools for any noise and vibration laboratory. These small systems are completed by a matching Sentek Dynamics LA Series linear amplifier. They are typically employed with a digital signal analyzer (DSA) for modal analysis and other vibration characterization or with a vibration control system (VCS) and a control accelerometer for closed-loop product qualification shakes. The VCS or DSA provides the desired excitation signal as an input to the amplifier. 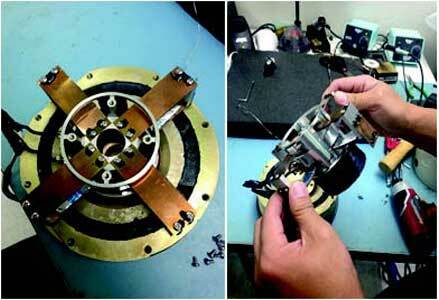 In turn, the amplifier’s high-current output drives the shaker’s armature coil, vibrating the test object. The LA Series are true power amplifiers specifically designed to drive the low-impedance coils of the MS and VT Series shakers with high-fidelity. They provide high drive-current, low distortion, high signal-to-noise ratio and wide bandwidth. Five different LA Series amplifiers are available, providing 100, 200, 500, 800 or 1,500 VA output power. The LA-100 amplifier provides a built-in sine wave oscillator. The remainder of our line consists of larger, more powerful vibration machines focused specifically upon environmental testing, wherein the device under test is attached directly to the load table of a shaker armature and the entire DUT is vibrated under control of a multi-channel VCS such as the Crystal Instruments Spider-81 or 80X Series. Systems of this type can reliably subject the test item to random, swept-sine or shock excitation profiles to match the requirements of virtually any military and/or commercial test specification.